Vision 4 offers a focussed approach, combining business strategy and experience, working with organisations in key areas and pinch points; adding value and removing pain ! The work usually involves a combination of internal process and performance review, combined with externally focussed appraisals. What process adds value to your business ? How does your business compare with your Competitors ? What values do your Customers aspire to and how do you support them ? This is about bringing in expertise to support defined objectives around volume, performance and efficiency. Utilising 25 years industry experience, Vision 4 works with organisations looking at chosen business areas, key customers and significant opportunities. Designed to meet specific customer objectives, this form of consultancy is results based, usually with a set target and timescale. 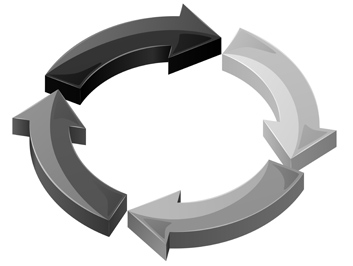 Business Process Reviews; these can be general, looking at the operating process of the business as a whole, or project specific looking at improvements in performance and efficiency. Key Account Plans; focussed on target Sectors and Customers, looking how to increase the value of business with key clients. Project management and performance enhancement; working with project teams, suppliers and customers to improve delivery of key objectives. EFQM Excellence model a standard process for evaluating and benchmarking business process, performance and capability.